In the throes of his Pon Farr mating period, Spock must return to Vulcan to meet his intended future wife, betrothed from childhood. "Amok Time" is episode #30, production #34, first broadcast on September 15, 1967, in the series' new time slot of 8:30 pm on Friday night, and repeated April 26, 1968. 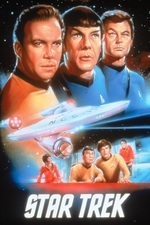 This was the first episode to feature regular cast member Walter Koenig, as the ship's navigator, Ensign Pavel Chekov, and also the first one to list DeForest Kelley as Dr. McCoy in the opening credits. It was written by science fiction author Theodore Sturgeon, scored by Gerald Fried, and directed by Joseph Pevney. The episode features First Officer Spock returning to his homeworld for a brutal Vulcan mating ritual. It is the only episode of the series to depict scenes on the planet Vulcan. The episode can be viewed on Netflix, Hulu, and YouTube. It's kind of a wonderful coincidence that posting this episode lined up perfectly with Valentines day. I agree with the TvTropes link in that there were some fairly large plot holes...for example: how did Starfleet not know of the Vulcan mating ritual? I guess it can be explained that they did not share cultural information with humans. This sort of lines up with how Vulcans are portrayed in the later Enterprise series. Spock himself found it really embarassing to talk about, even with people he knew well and trusted with his life. But yet, in The Cloud Minders, he's all bewitched by Droxine and blabbing his fool head off about it. Also, he's in his thirties, yet he's never experienced it before? THAT seems improbable. But its a fun episode and the fight music is enduring. It always perplexed me how someone without emotions would feel embarrassment, just not logical. A common misconception. All Vulcans feel emotion. They just don't let them make their decisions for them. Yes, the Vulcans embraced logic because they were too emotional, and they realized their emotions were apt to destroy them. So it's not that Vulcans don't feel (a thing explored at great depth in post-TOS Trek) but that cultural survival required them to suppress their emotions on a scale that makes the Puritans look like Sadean egoists. Yes, the Vulcans embraced logic because they were too emotional, and they realized their emotions were apt to destroy them. Yeah, this. Amok Time is one of the first places that ever really comes out, or maybe *the* place? Of course - and this is something I literally never thought of until I started posting here just now... Surak was totally wrong. The Romulans are Vulcans who simply left during some big schism centuries ago, before the whole 'logic is the best' thing got going, and they're... just fine. I mean, they're mostly jerks onscreen since they're primarily an antagonist from a Trek POV, but they don't come across as irrational at all. It's possible that Romulans have developed different coping strategies, such as being huge dicks. Given the difference in lifespans (Vulcans can live for 200 years or so), it's not that surprising that it takes longer to hit the equivalent of puberty, I think. I remember in the old Trek fanzine, Ponn Farr to a lot of speculation. That was brought up, as well as the whole "mate or die" bit. Every seven years . . .
"Year" and "year", what is "year"? Except in The Search for Spock, we see him deal with Pon Farr relatively "early." So either he's been mentally suppressing it or...something, that wasn't available to him when he was rapidly aging on Ceti Alpha V. Either way. But we're picking nits. It's fun to see Spock all savage isn't it? That wig of Chekov's is just so wonderfully awful. And this may be the best it ever looks, per the Memory Alpha link this was the last episode they shot with it -- I seem to remember it being at it's most "what is that dead creature on his head?" in Catspaw. My takeaway: Kirk has a crush on T'pau.